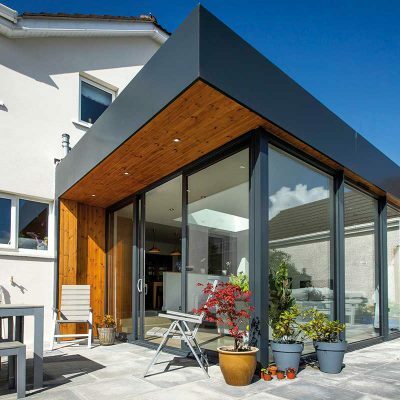 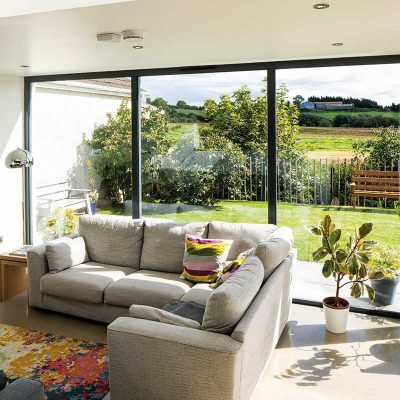 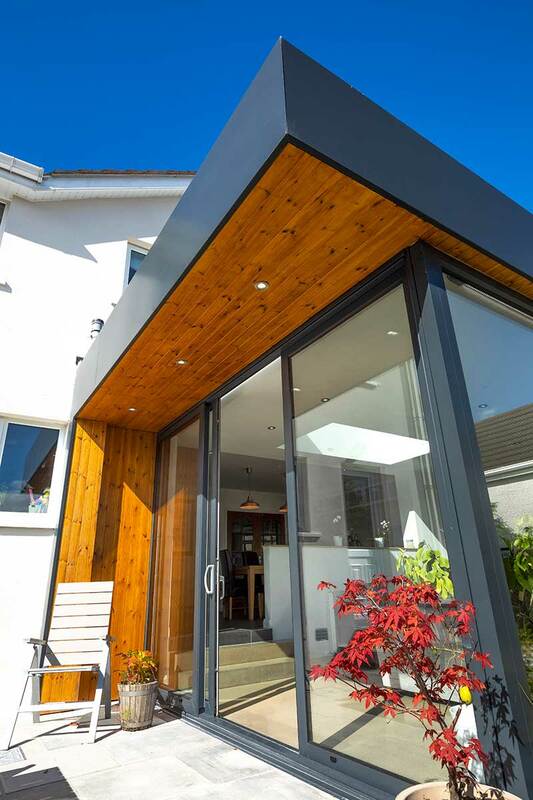 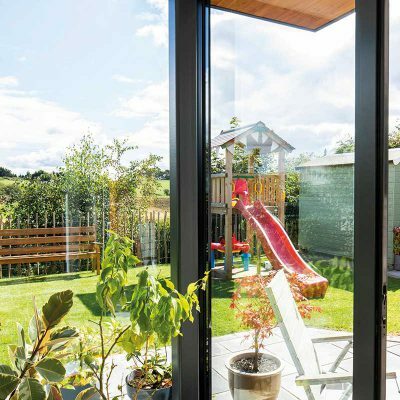 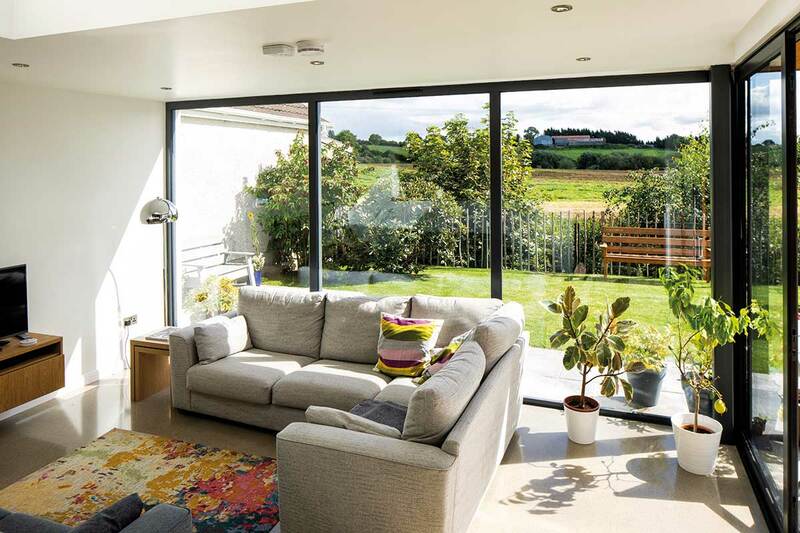 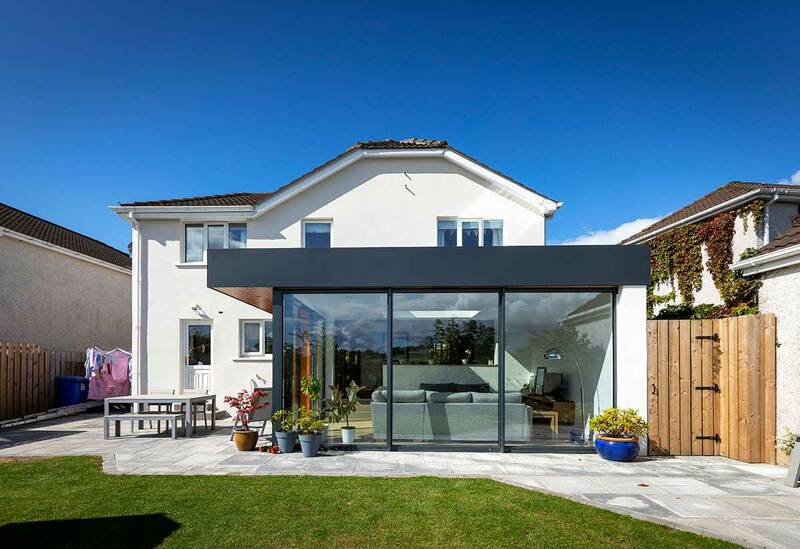 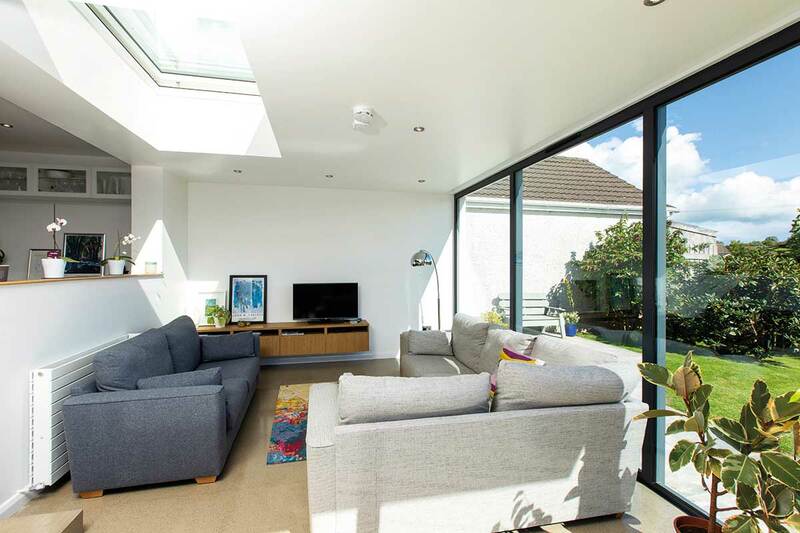 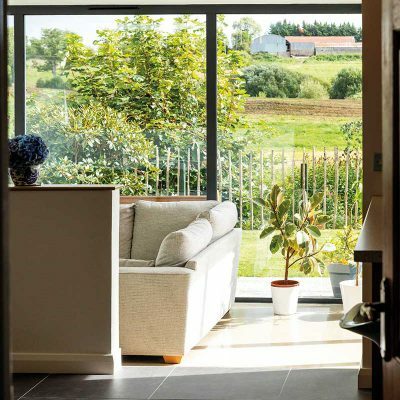 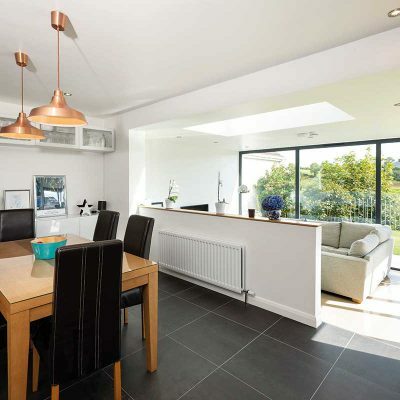 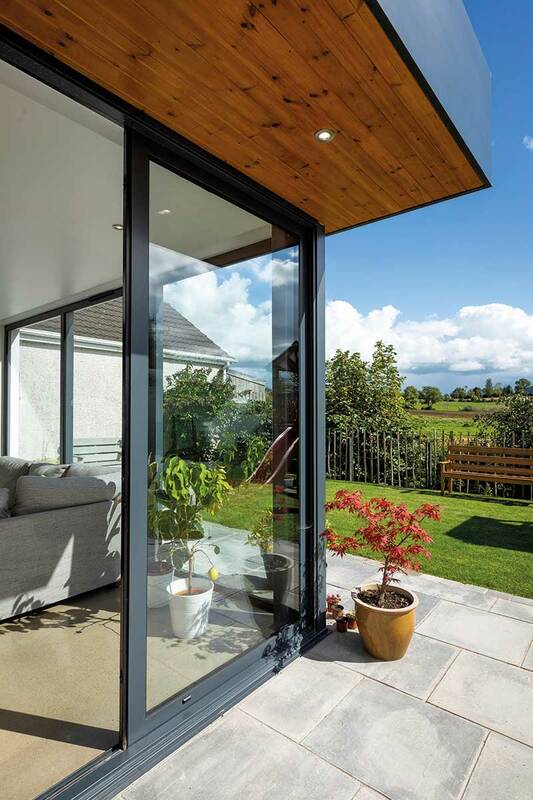 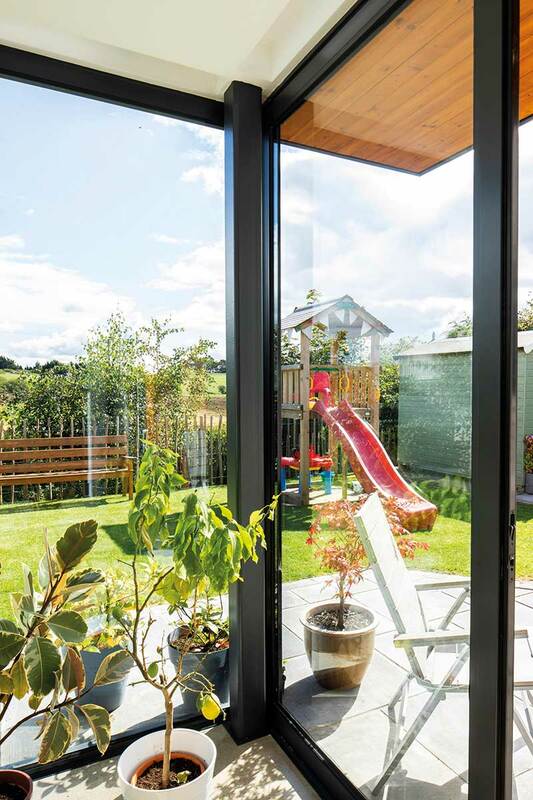 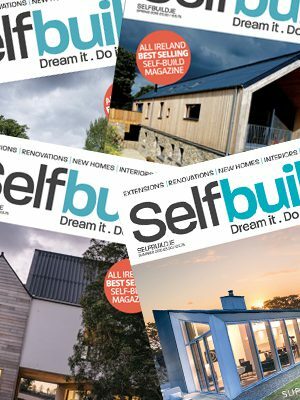 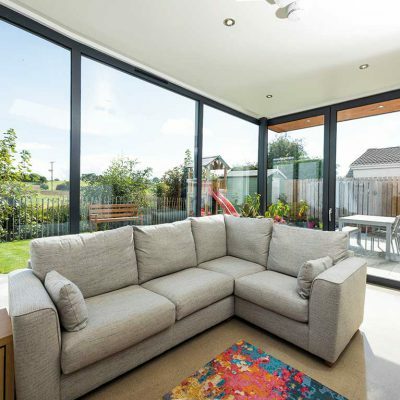 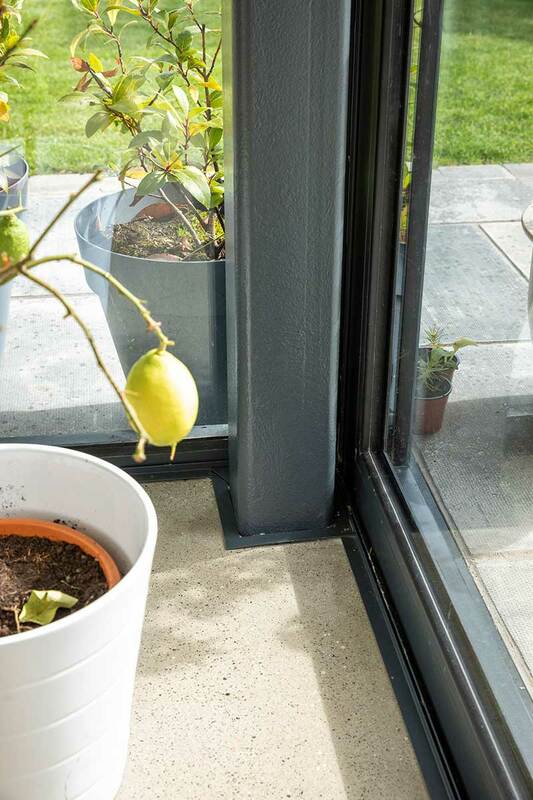 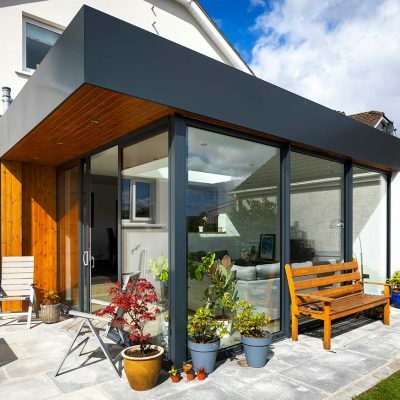 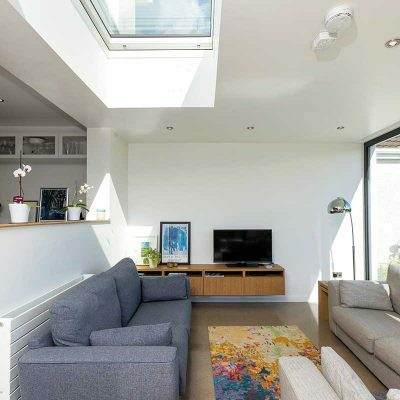 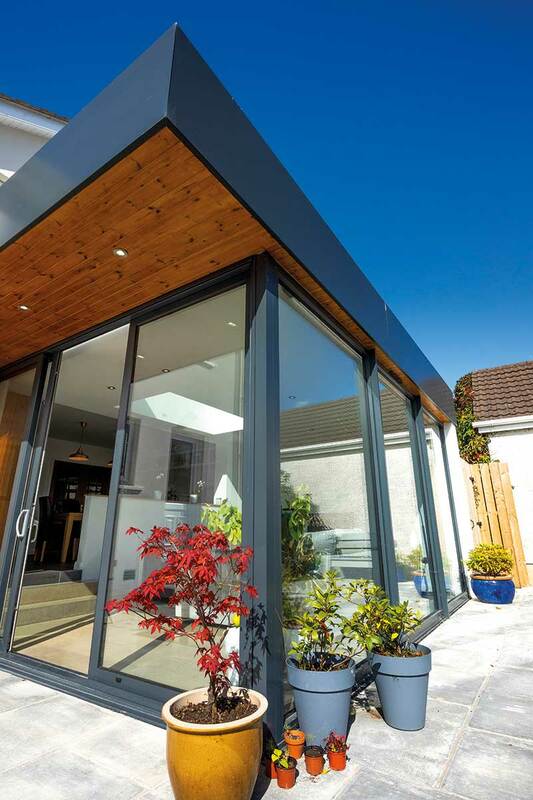 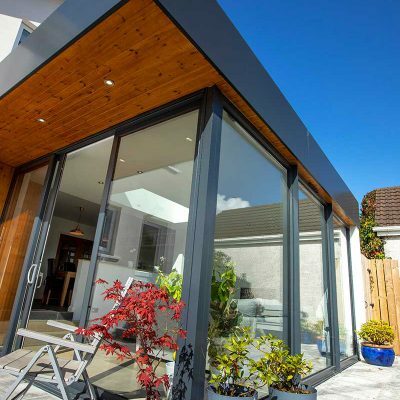 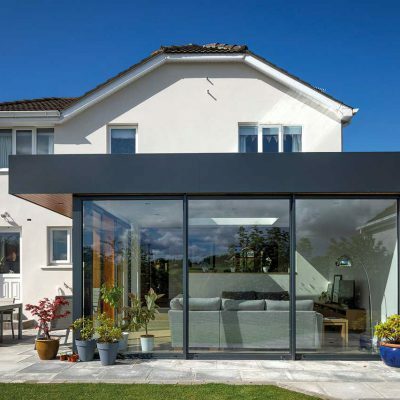 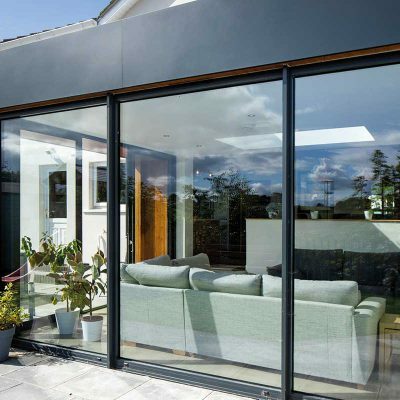 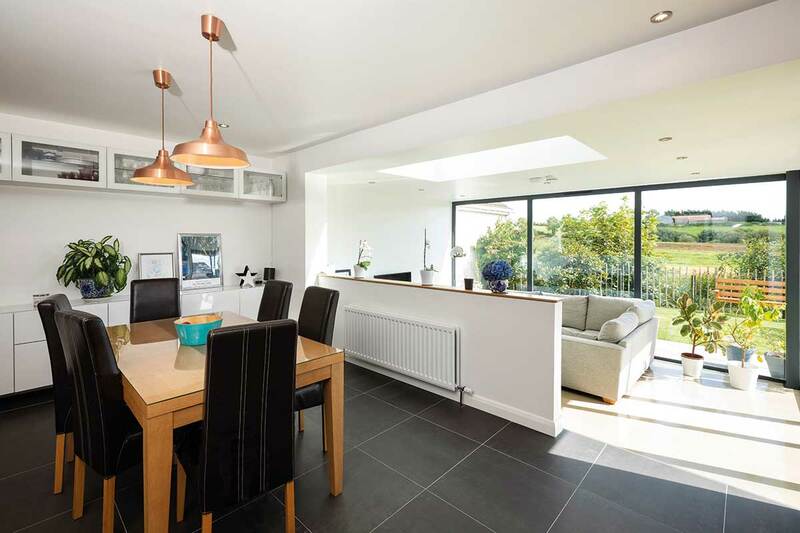 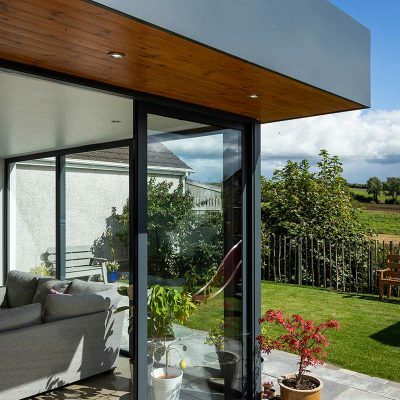 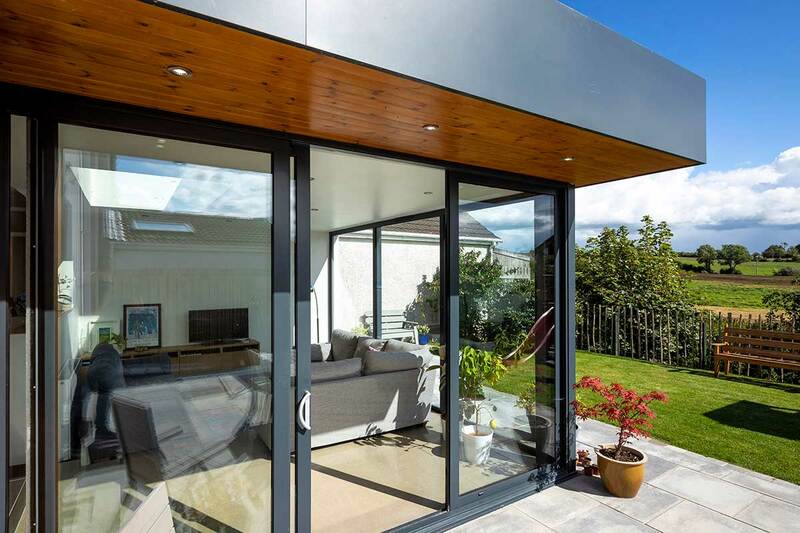 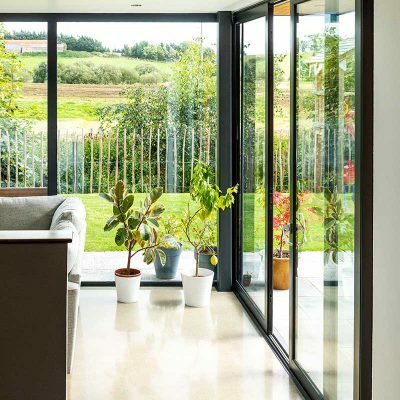 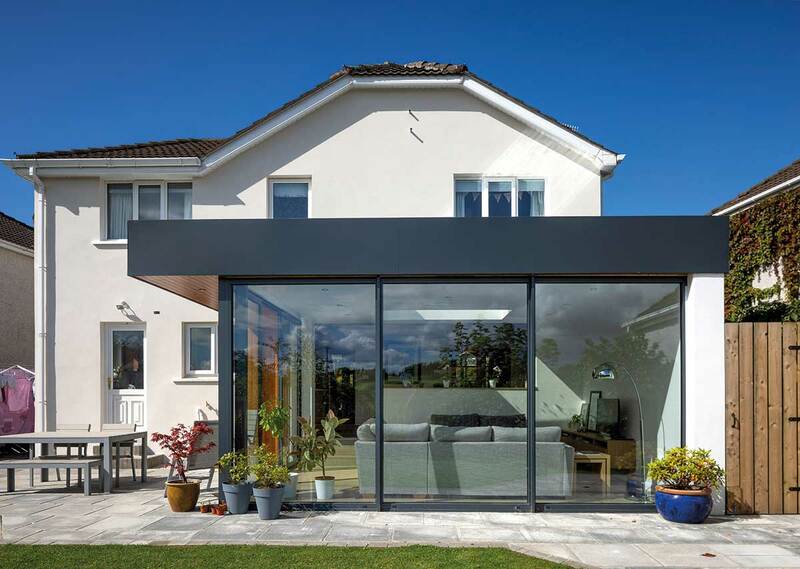 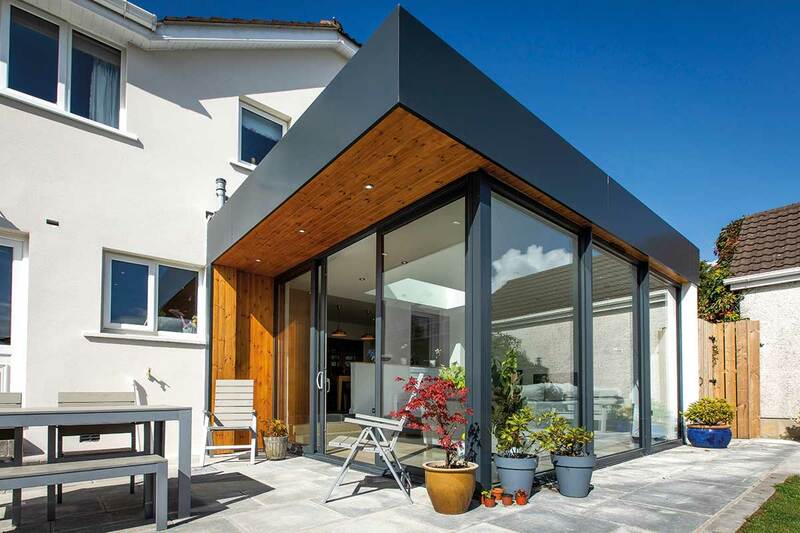 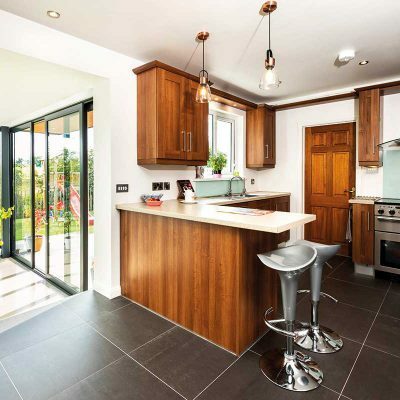 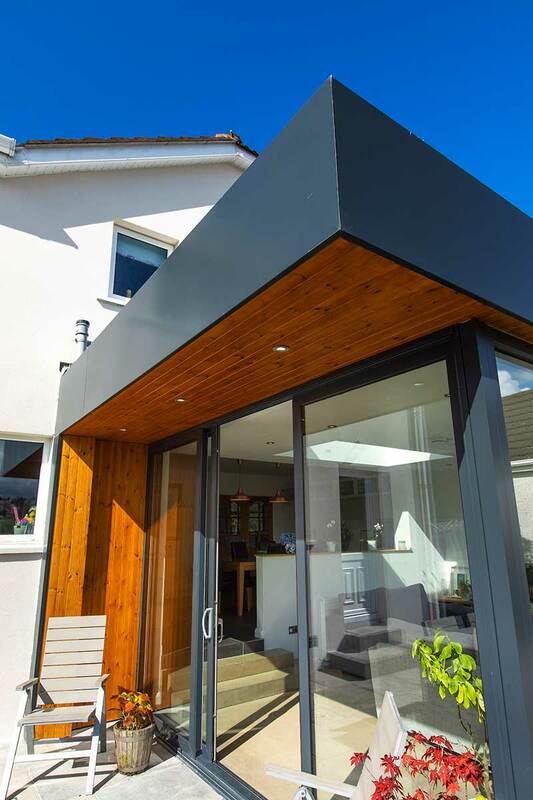 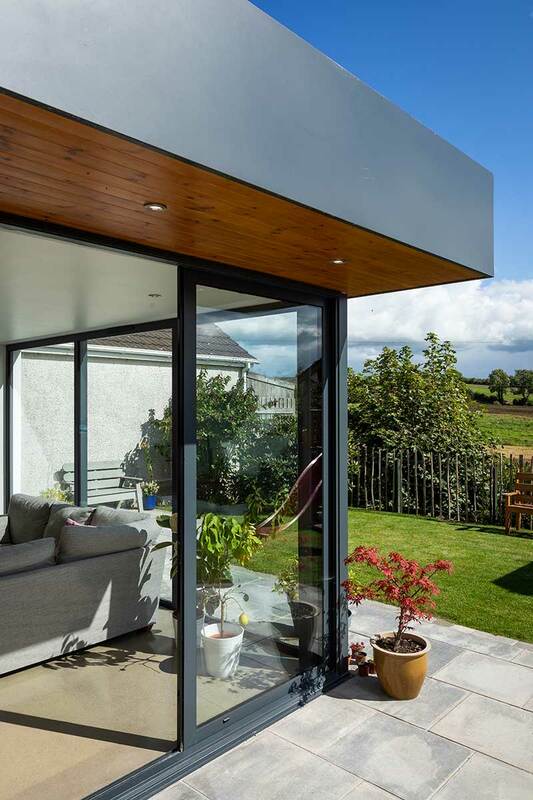 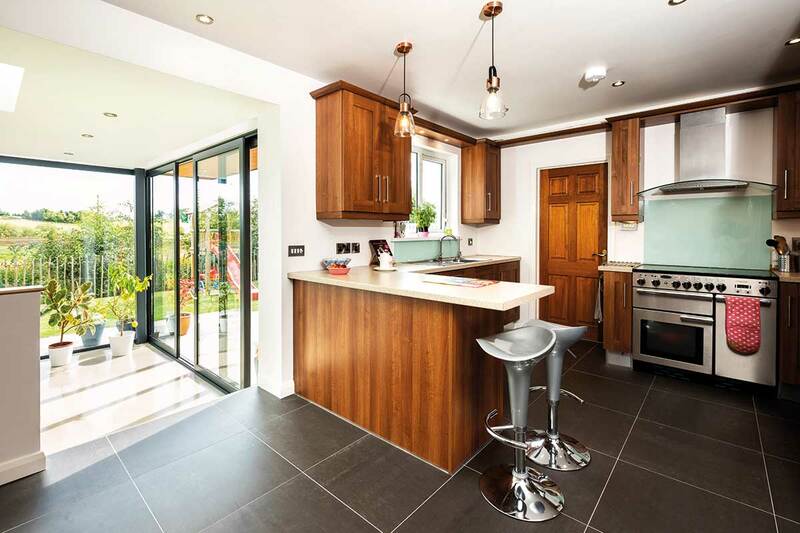 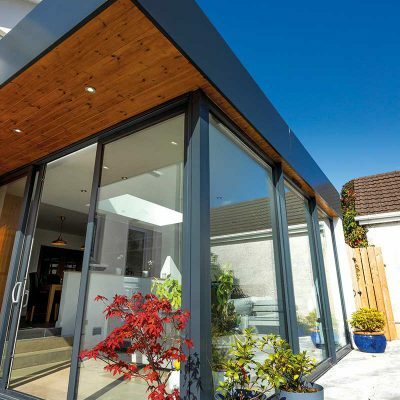 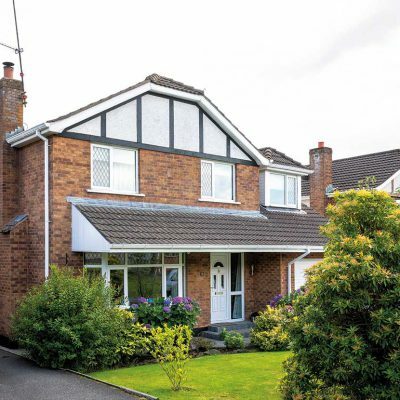 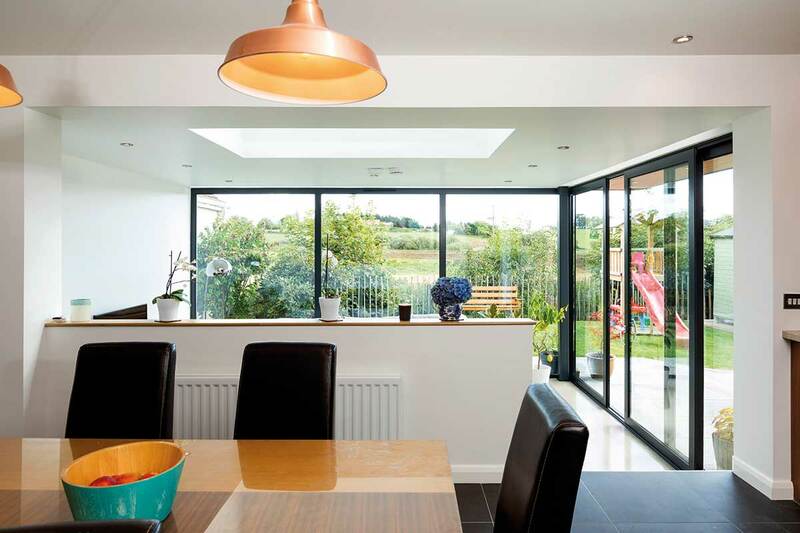 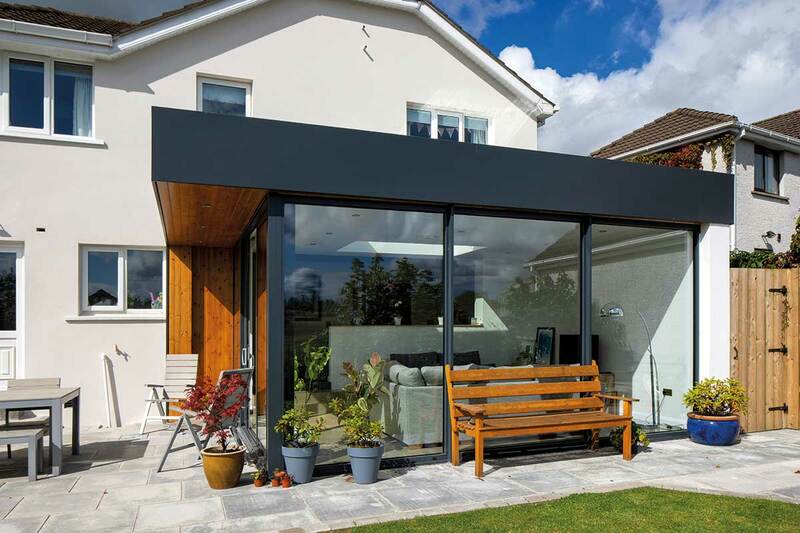 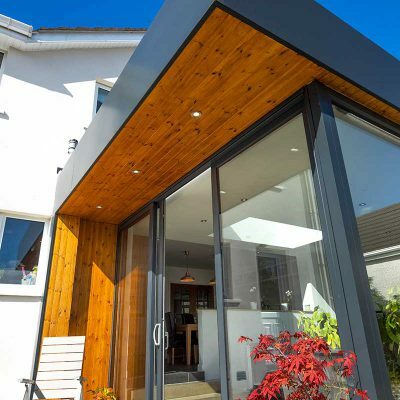 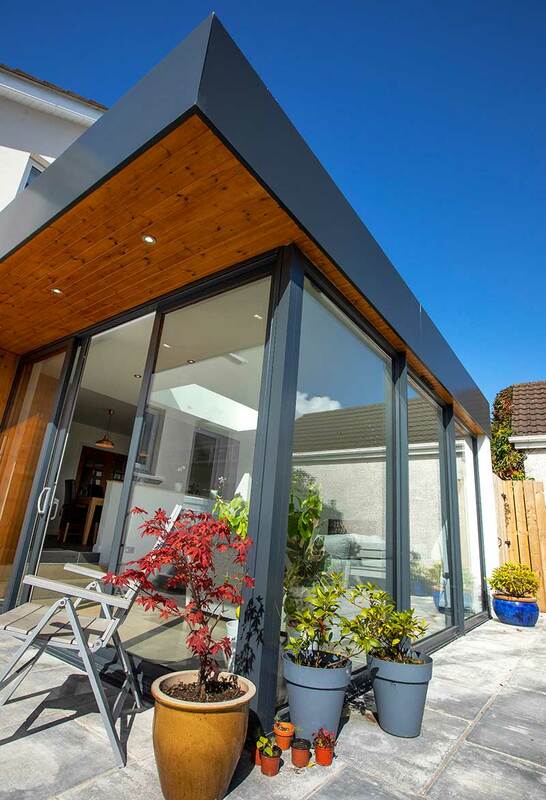 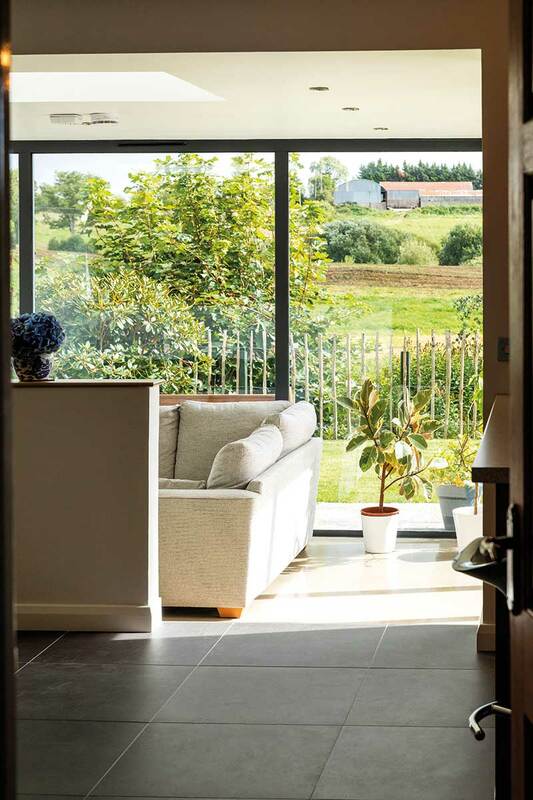 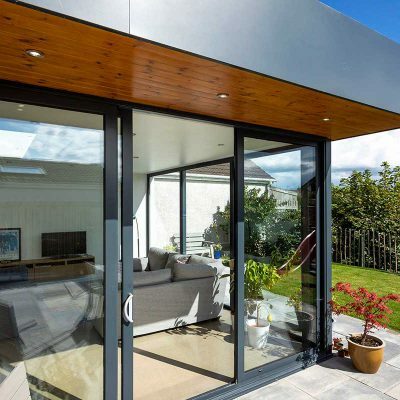 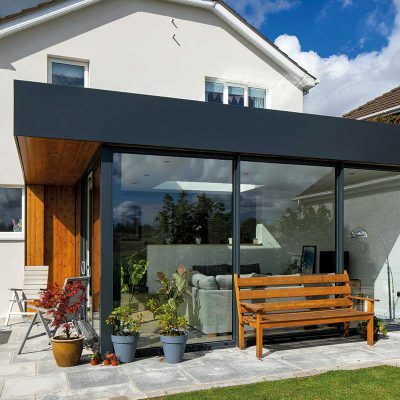 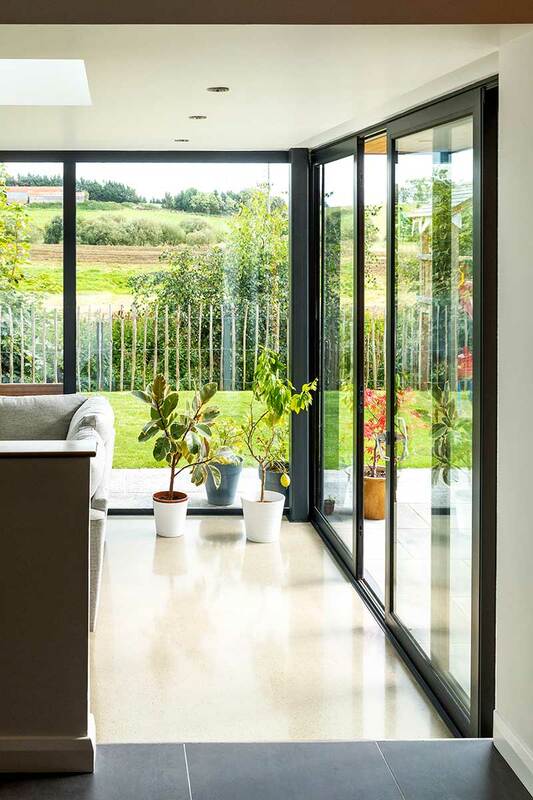 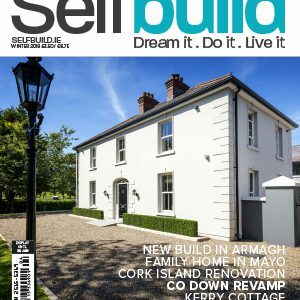 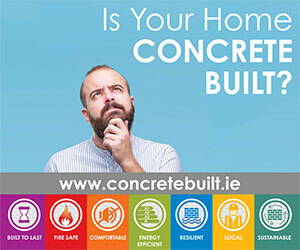 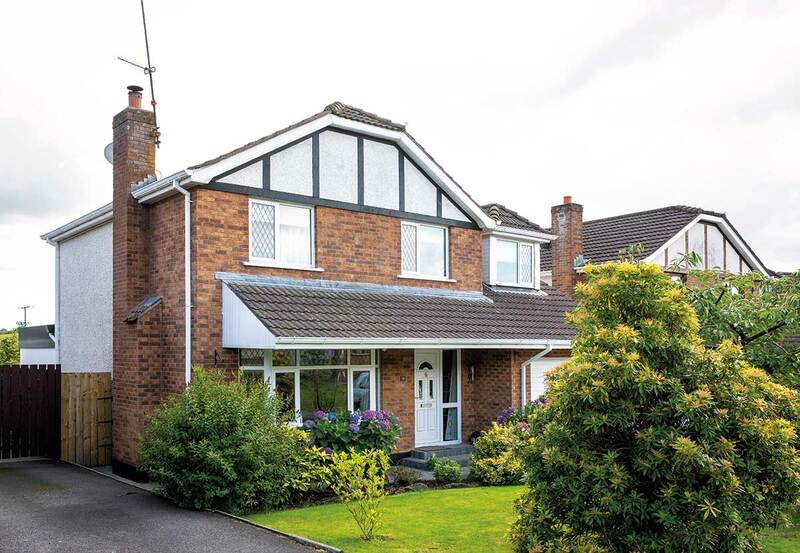 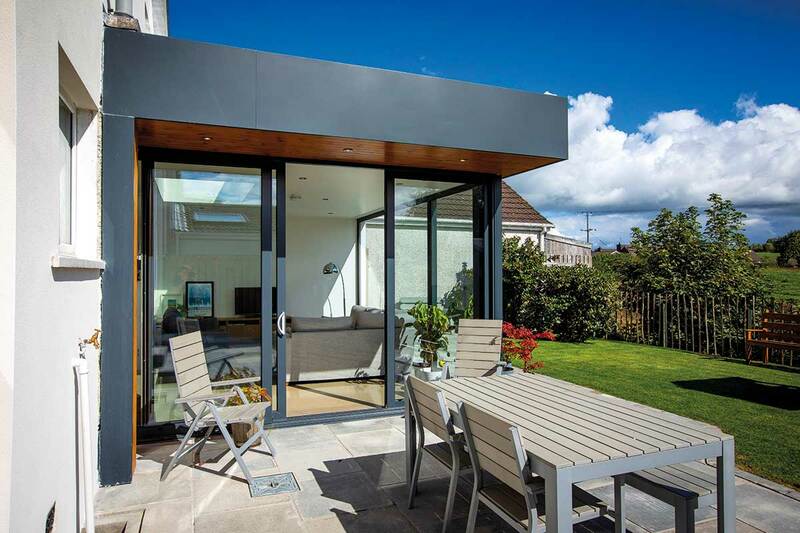 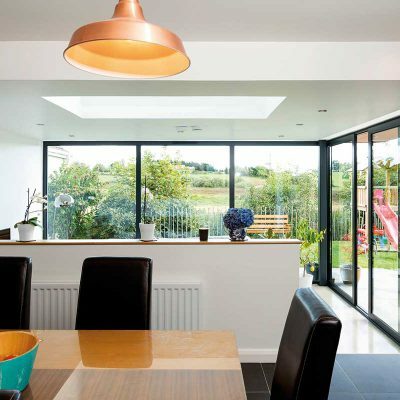 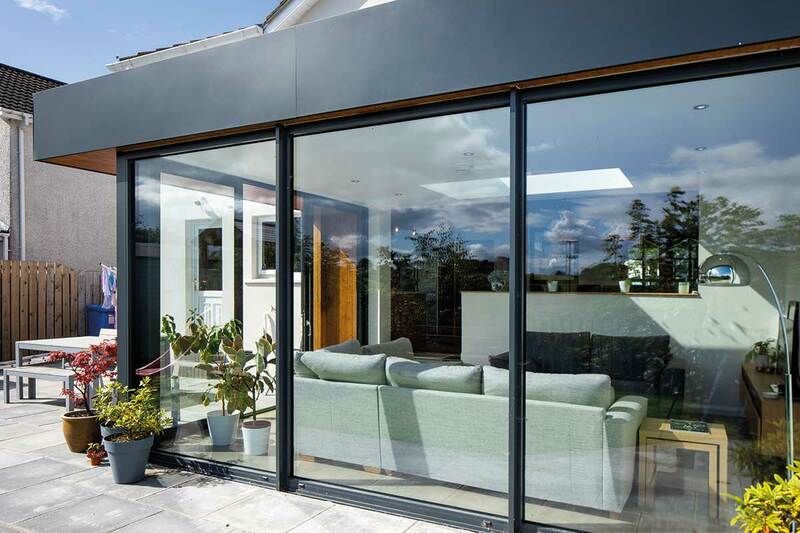 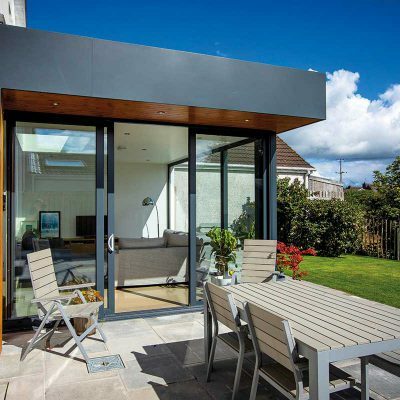 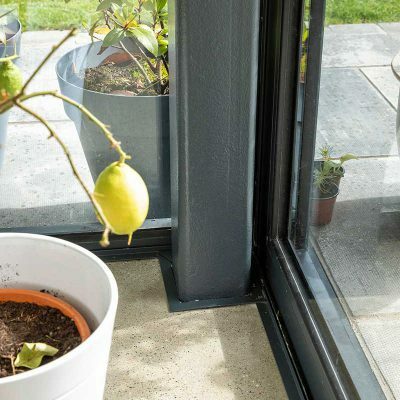 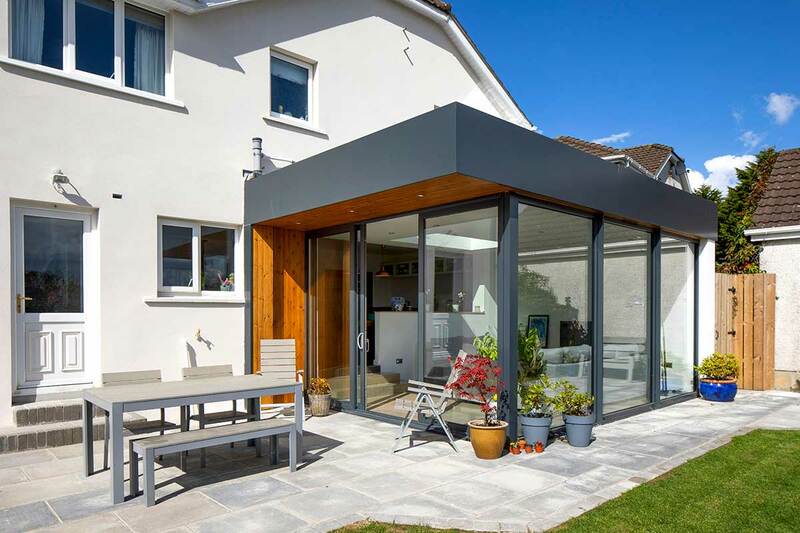 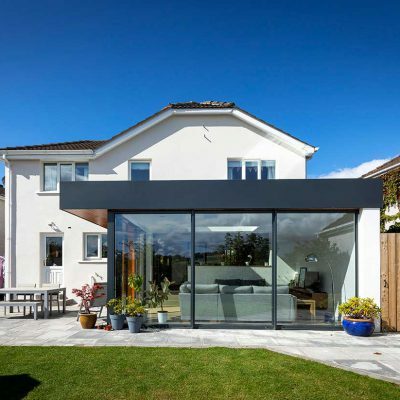 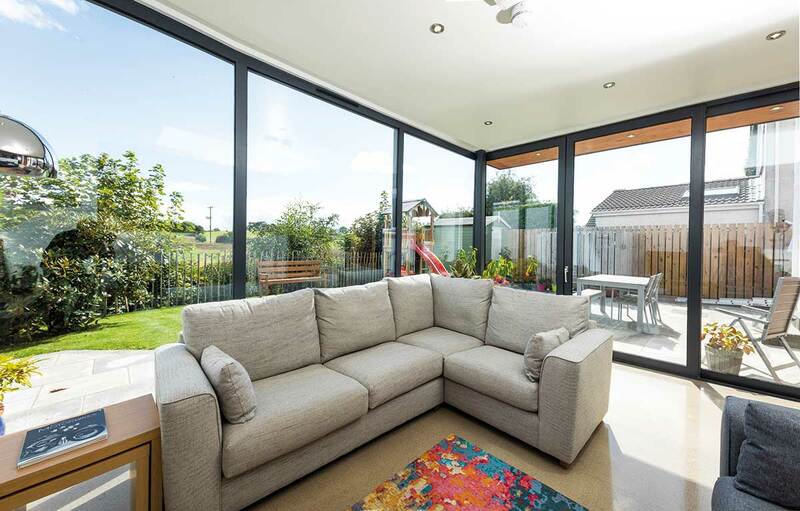 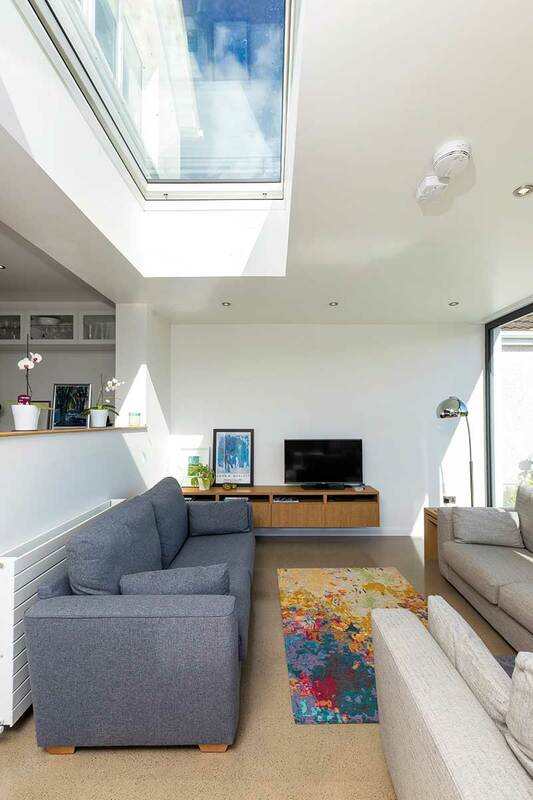 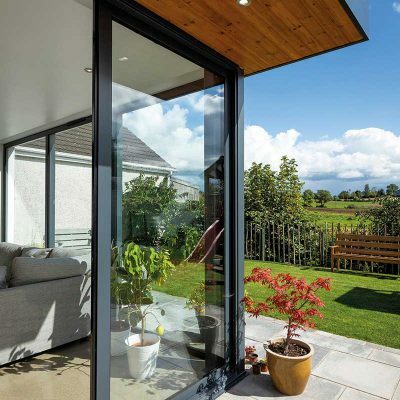 To get the most out of a renovation or extension project you need to have lived in the house for at least a couple of years to see what changes will work best for you, working from the inside out, as Gayle and Graeme Doyle of Co Down found out. 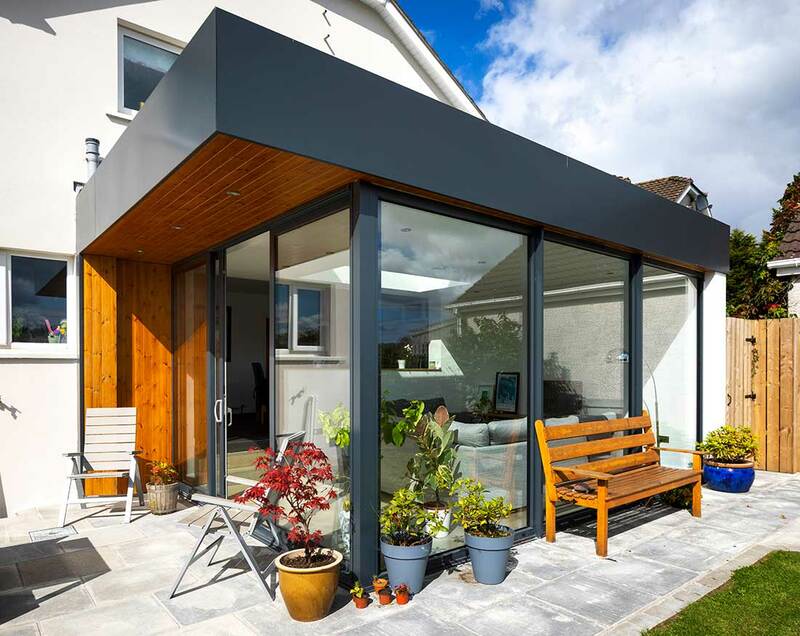 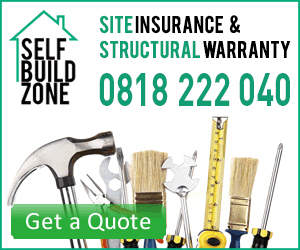 Extension: steel frame forming roof and cantilevered canopy with masonry rear wall and single ply membrane roof. 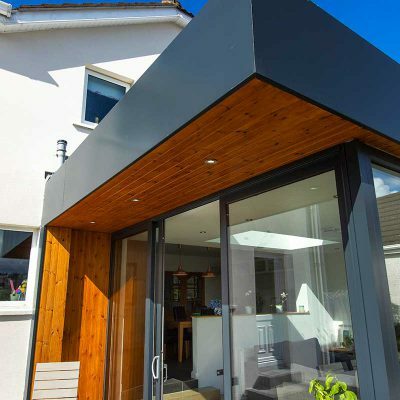 The parapet is clad in PPC Aluminium (Polyester Powder Coated Aluminium) with secret fixings and clad in tongue and groove timber. 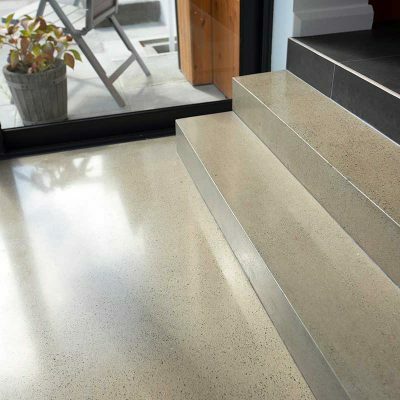 Be prepared for the impact it will have on the rest of the house. 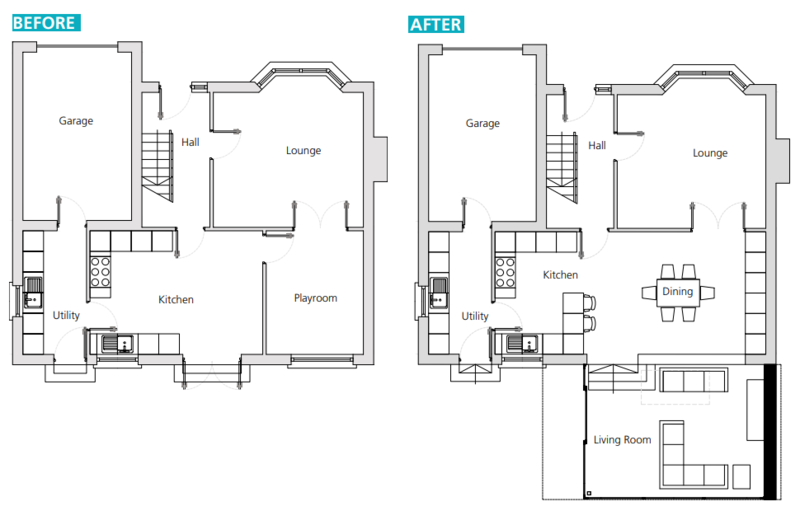 We were still living here with two small children and were basically renovating our kitchen. 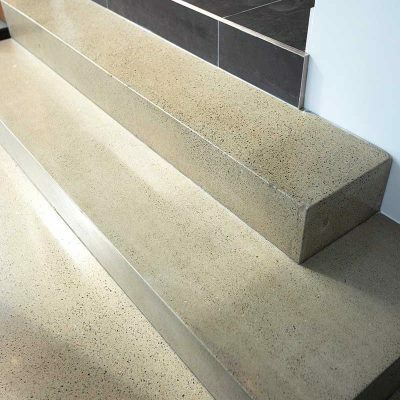 The dust just gets everywhere especially if you need to cut concrete; the polishing was also kicking up a lot of dust. 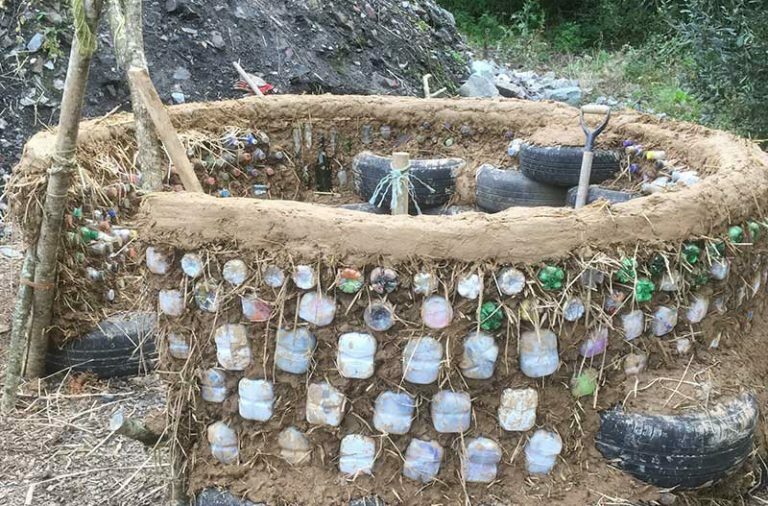 It’s very messy. You either clean more often or accept you can’t stay on top of it. 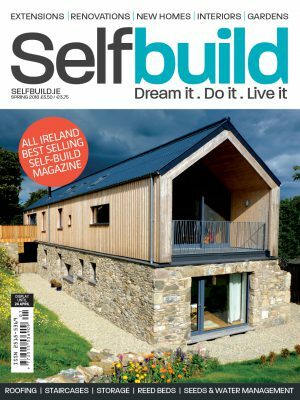 We did try to seal up the room and it worked for a while with temporary hoarding and pallets which meant we could still use the kitchen. 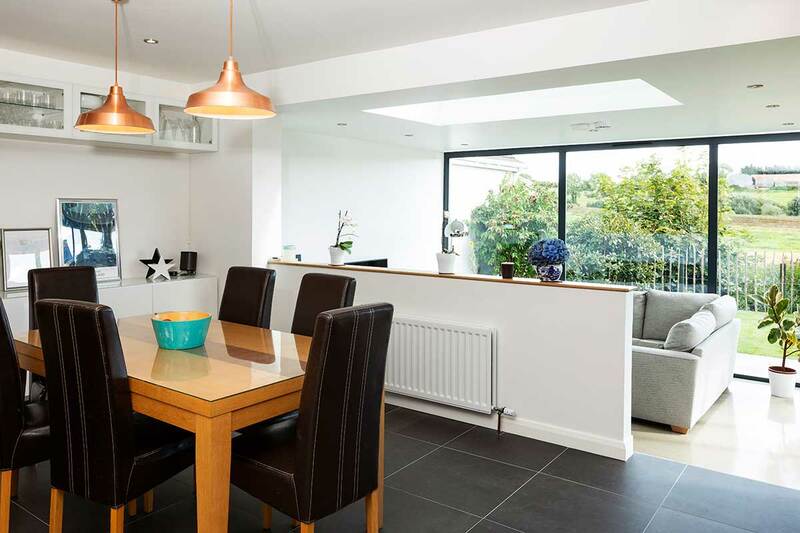 But even though the builders did their best to keep the place tidy we’d have to come home each evening and assess the situation. 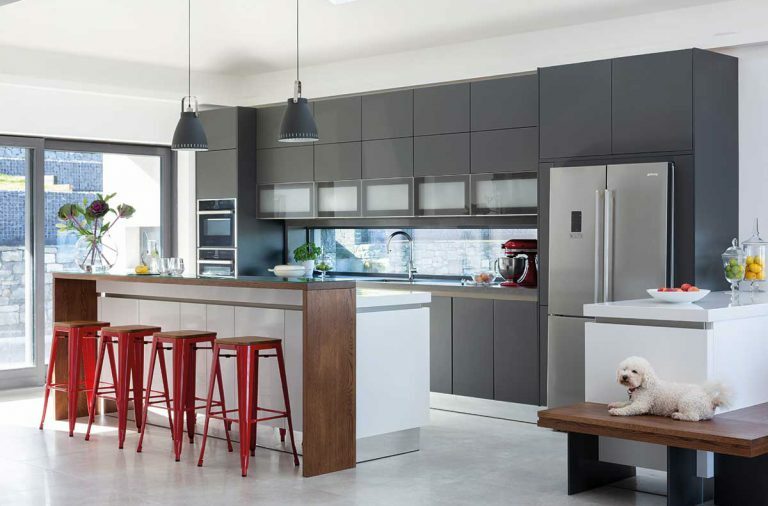 We decided whether or not to make dinner or if it’s another tip to McDonald’s. 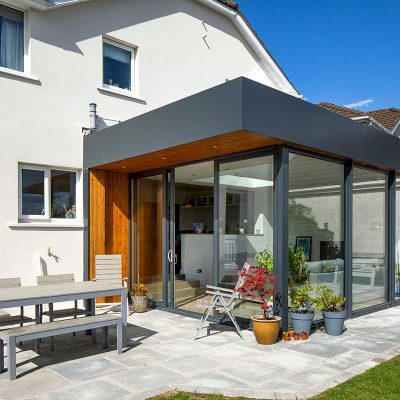 We’ve eaten more fast food in that year than we ever have in our lives! 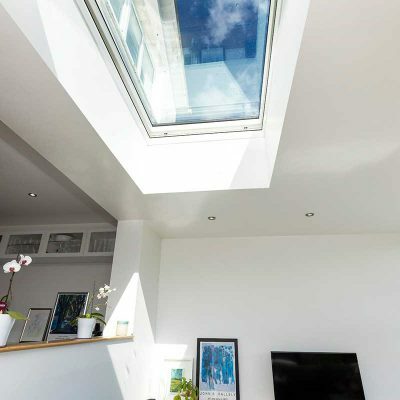 have multiple sources of light in the room. 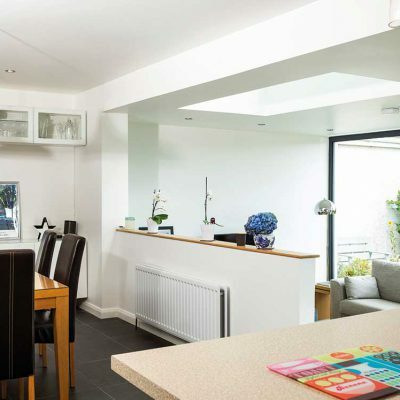 We upgraded the lighting in the kitchen too and it’s made a real difference to our enjoyment of that space. 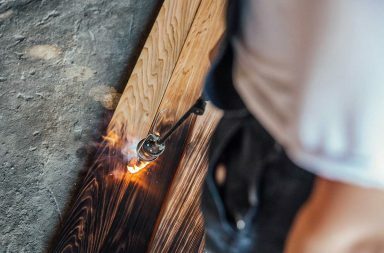 Source things yourself to save time. 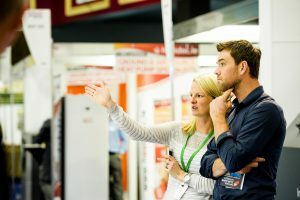 We tried to help with the schedule where we could and this meant sourcing a few of the things we needed. 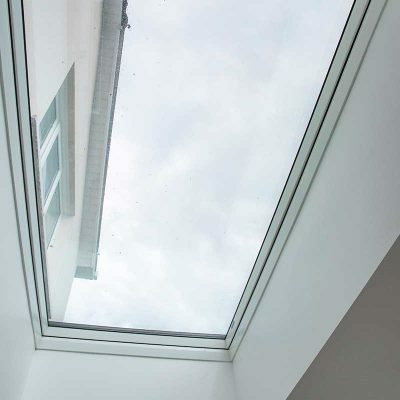 The rooflight was especially difficult to find. 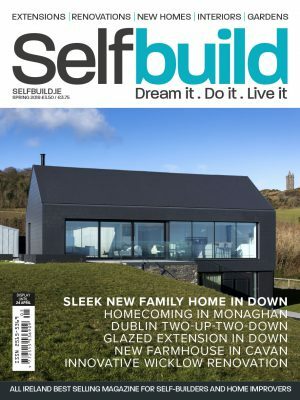 It seems some of these items are hard to get in NI. 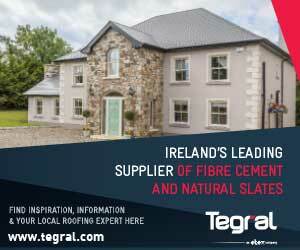 We eventually found it through a builder’s merchant in ROI and organised delivery from there to the site. 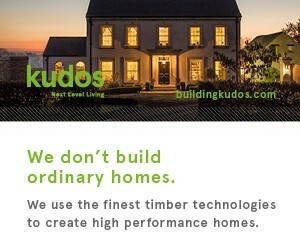 We did what we could to help keep within budget and stay on schedule. 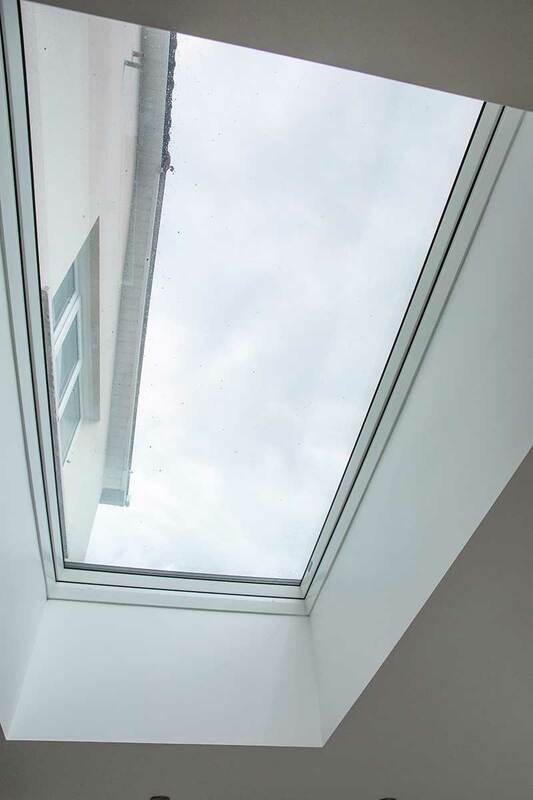 What’s your favourite feature? 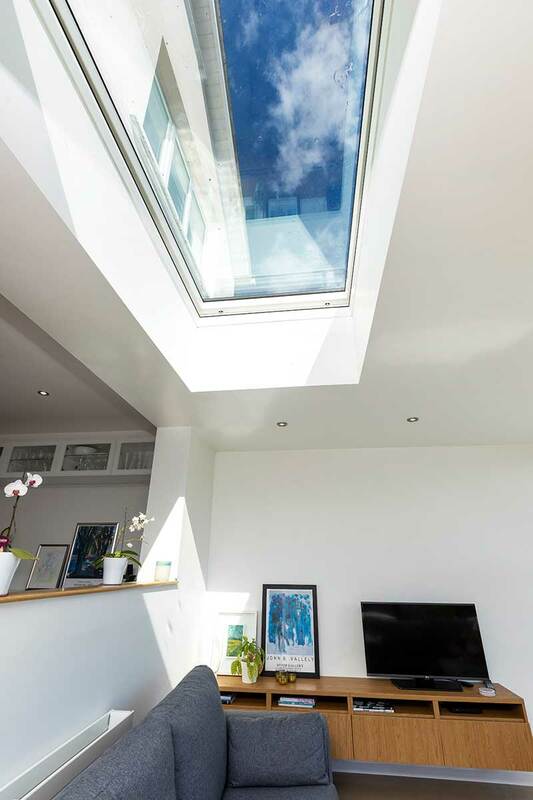 I love the light. 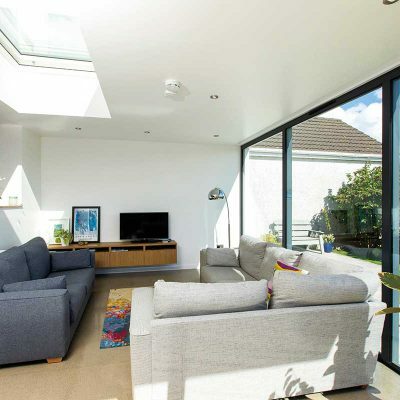 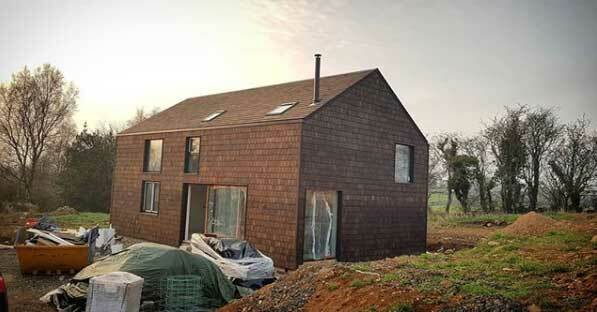 The extension is a bright relaxing space without too much furniture. 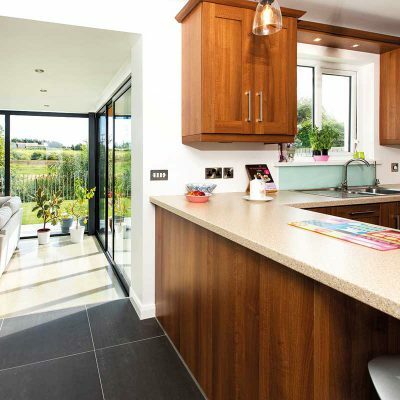 It’s great to entertain in, especially in summer. 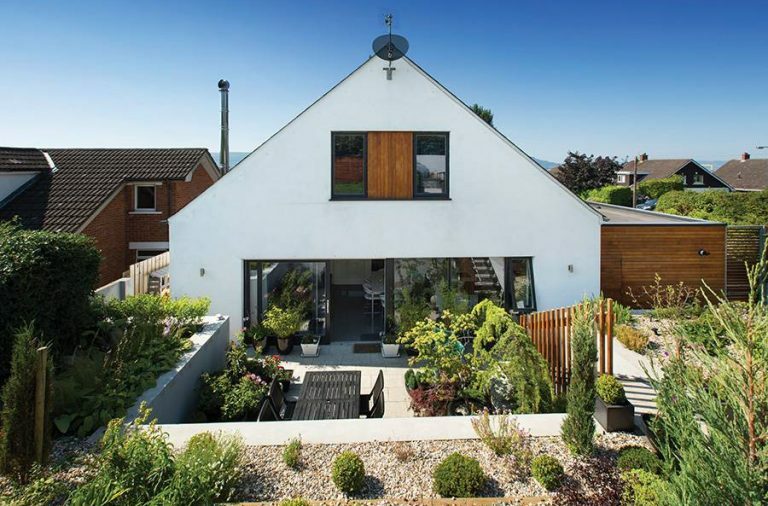 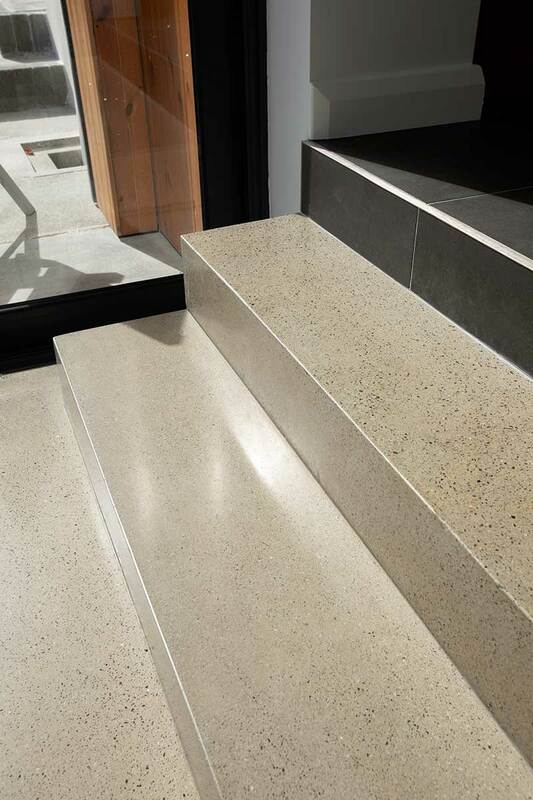 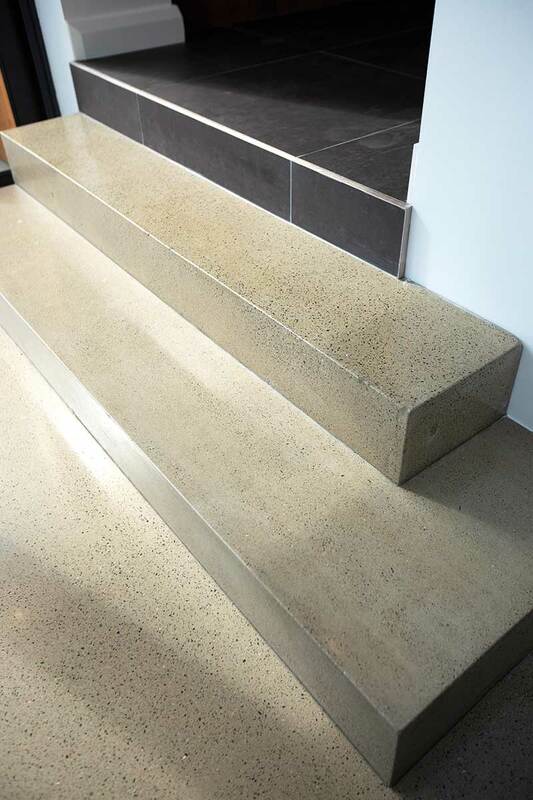 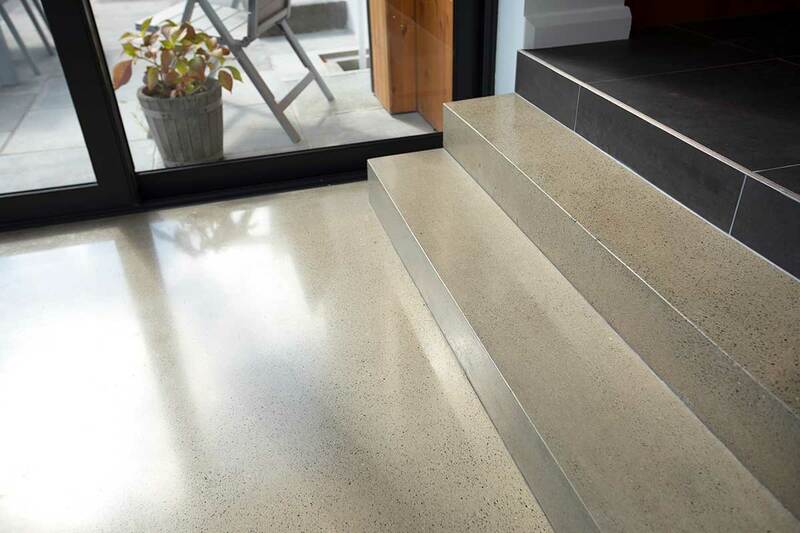 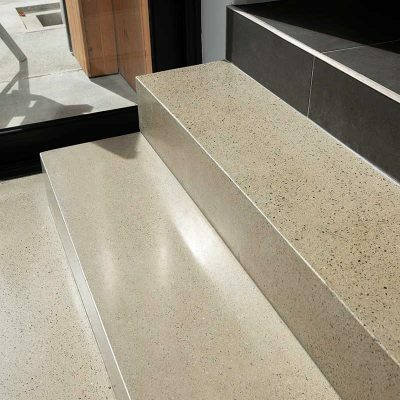 What single piece of advice would you give someone who’s thinking of a renovation? 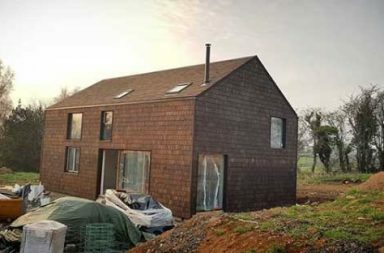 Live with the house for a while. 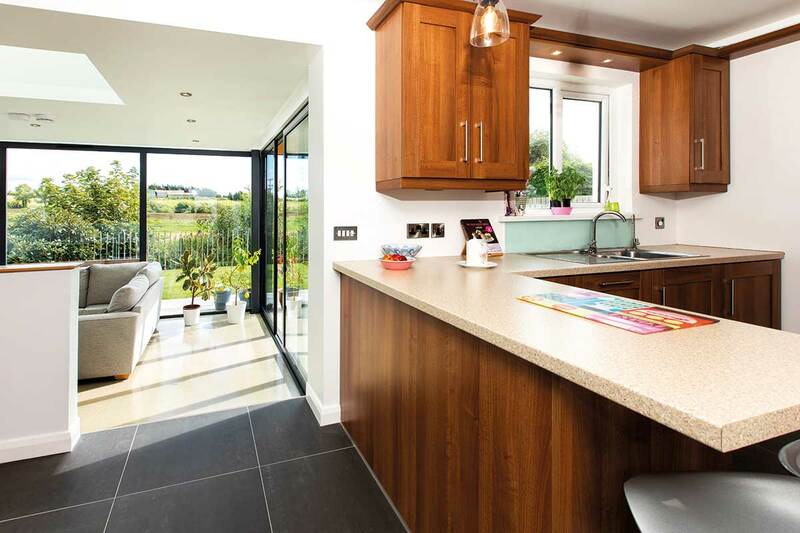 We realised we only needed to add a breakfast bar so didn’t have to go through the expense of upgrading the entire kitchen. 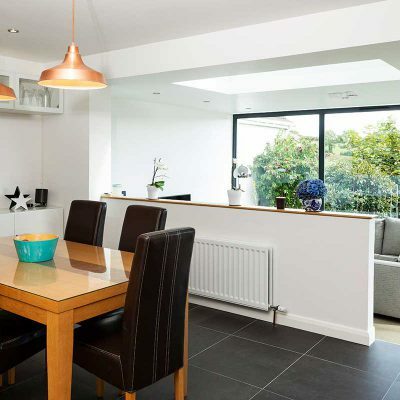 Add as much storage as you can, we added a whole wall of storage to the back of the dining area which means that all the puzzles, games and colouring pencils can be put away easily. 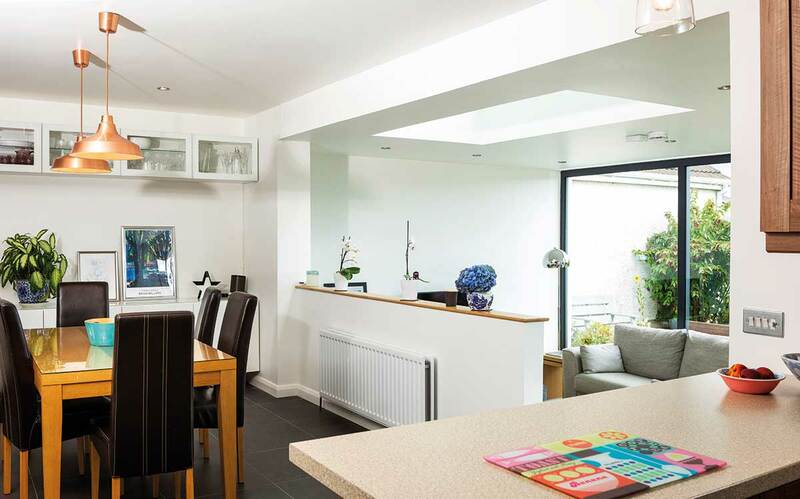 We had a few empty cupboards after the project but 18 months later and everywhere is full.